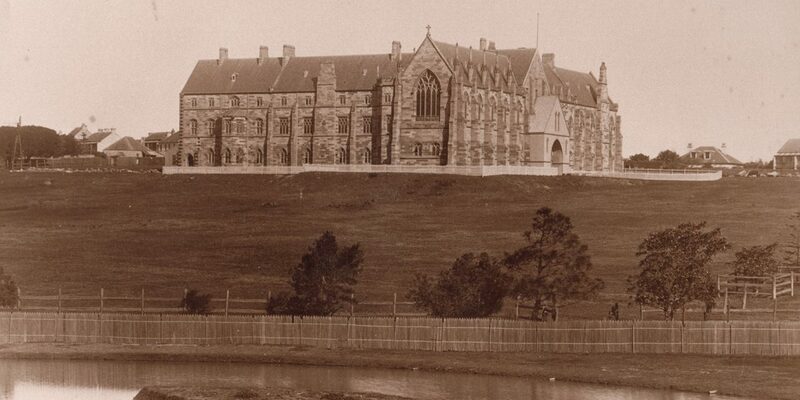 The University of Sydney was established in 1850 shortly before the introduction of “responsible government” in the colony of New South Wales. Prior to this time the colony had been administered by a governor with wide executive and legislative powers, commissioned by the United Kingdom government and advised by an appointed local Legislative Council. In 1856 an elected Legislative Assembly was introduced (albeit with a very limited franchise) as the lower house of a bicameral legislature. The population of New South Wales in 1851 was about 200,000 and Sydney about 39,000. The place of religion in the proposed university was the subject of intense debate. At this time many older universities in the United Kingdom, and in many parts of Europe and the United States, had strong governance connections with established churches. Oxford and Cambridge, for example, required students to satisfy a religious “test”, that is to declare adherence to the established Church of England. But in New South Wales there had not been an “established” church since at least Plunkett’s Church Act of 1836 and the population was broadly divided between Catholics and the main Protestant denominations. At Sydney the scheme which was ultimately adopted was that the University itself would not have a religious character, but the government would aid the foundation of colleges by the four main Christian denominations in the colony at the time – Anglican, Catholic, Presbyterian and Methodist. The government assistance on offer required financial commitment from the denominations themselves: so long as at least 10,000 pounds were raised, the government would match the amount up to 20,000 pounds and make land available within the University’s land grant for the building of a college by that denomination. The Catholic Archbishop of Sydney, John Bede Polding, was an enthusiastic supporter of the scheme, and he may be regarded as the founder of St John’s. Due to Polding’s advocacy and the generosity of the Catholic community an amount exceeding 20,000 pounds was pledged in a short period. English law had always recognised bodies established for the advancement of education, such as the Oxford and Cambridge colleges, as charitable corporations; as such they could hold property and continue for an indefinite period. However the legal status of incorporation could only be achieved by specific governmental authorisation. In England corporate status for colleges had normally been granted by royal charter, but there were legal doubts as to whether a colonial governor could issue a charter. It was thus the practice in the colonies for the government to grant corporate status by legislation, and there are many examples in New South Wales of charitable bodies, including schools and colleges, being incorporated in the nineteenth century by Acts of the NSW Parliament. The St John’s College Act 1857, which received the Governor’s assent on 15 December 1857, was one of the early Acts of the new bicameral parliament which first sat in 1856. The Proclamation was duly made by Governor Denison on 1 July 1858 and published in the Gazette the following day, so 2 July 1858 should be taken as the foundation date of the College. St John’s College is perhaps the grandest Gothic Revival College in Australia, designed by one of England’s (and Australia’s) foremost ecclesiastical architects of the mid-nineteenth century. A rare realisation of A.W.N. Pugin’s ideal Catholic College (and in turn based on Magdalen College, Oxford) it demonstrates the influence of Pugin on the work of architect, William Wardell. Built entirely in sandstone, the college is fourteenth century English Gothic in style and substantially Renaissance Baroque in plan, in the manner of Wardell’s earlier monasteries and convents. There are fine interior spaces – such as the Chapel, Great Hall, Library and Imperial Staircase – all on a scale grander than Blacket’s St Paul’s College, though Blacket himself supervised the work in 1860-62 after Wardell’s resignation. In 1858 it was suggested that William Wilkinson Wardell (1823-1899) offer his services to the Very Rev. D.M. O’Connell as an architect for St John’s College. At the same time a set of plans was produced for the College building under the immediate direction of Archbishop Bede Polding, the Founder of St John’s. These plans were intended as a general guide for the selection committee. In February 1859 Wardell was appointed architect for St John’s. Working in Melbourne he drew up the general plans and sent them to Sydney in May. Because of a very tight budget with a limit of 30,000 pounds, July and August saw discussion of Wardell’s design and of how much could be built within the budget. In September and October the general plans were approved by the St John’s Council and the University Senate. For the six months up until April 1860 detailed plans and working drawings were drafted. Wardell designed St John’s College as a three-storey sandstone Gothic Revival building on an H shaped plan. Stylistically, St John’s is 14th Century English Gothic in detail, yet the building is markedly Classical in its design (i.e. from Renaissance and Baroque tradition). During the period from October 1859 to April 1860 relations between Wardell and the Council deteriorated for various reasons, ultimately ending with Wardell’s resignation being accepted by the Council in June 1860. With the main building programme already in progress the Council retained Wardell’s plans and proceeded with the construction under the supervision of Edmund T. Blacket, another of Australia’s best known colonial architects who had finished construction of the first stage of St Paul’s College at the University of Sydney the previous year. When Blacket was appointed to supervise the construction of St John’s he was given one restriction by the Council. The problem of funds became so severe that much of what Blacket strongly advised just could not be built. Some of the changes Blacket made to Wardell’s specification were the substitution of Australian Hardwood for Pitch Pine, the use of bar trusses in the Chapel, omission of a fountain, use of common bricks instead of fire bricks, substitution of Colonial for Portland stone and the use of ornamental pillars in the library. Blacket estimated that these and other changes would occasion a saving of 1,689 pounds, thus leaving the amended quote at 35,754 pounds. When the College was finally occupied the cost of construction for the first stage was in fact 40,000 pounds. The next project for the college came 56 years later in 1918. It was Wardell’s son, Herbert, working with his partner Denning, who was the architect for the job. Herbert was considerably experienced, having taken over the plans of St Mary’s Cathedral after his father died in 1899. Wardell and Denning designed what is known as the ’38 wing (it was eventually begun in 1938) estimating the cost at 14,000 pounds. Construction was not started for 20 years because of lack of funds and was finally finished on a reduced scale in 1939. In 1937 Countess Freehill donated 15,000 pounds to the College on the condition that it be used for the erection of the tower and that Hennessy and Hennessy be the architects. The design for the tower was 10 metres shorter than Wardell would have liked. Wardell believed that without the full height of the tower, the horizontality of the building would not be balanced. Nonetheless the tower was built to the amended design. The 1960’s saw great activity with extensions to the College. In 1961, 100 years after the first construction, Menzies Wing on the east end of the South Range was begun. The architects were McDonell, Mar and Anderson. In 1962 the Refectory was extended through to where the sacristies were, leaving an open arcade where the eastern wall had been. Extensions were also made to the kitchens and a lift was installed to replace the dumb waiter, still visible in the northern wall of the Great Hall. The architects were McDonell and Mar, who also built the Polding Wing on the west end of the South Range in 1967. Although these wings are four-storeys and very different to the design of Wardell, the architects have looked back to his design for guidance and inspiration. Their modifications of Wardell’s original design for 76 students have enabled the present building to accommodate 185 students. This new wing is made up of 73 double ensuite rooms for students and apartments on the fourth level for the Rector and his family, the Dean of Students, tutors and visiting academics. The opening and blessing of the Hintze Building was held on the 28 February 2010 and was a historic occasion, attended by His Eminence Cardinal Pell and Her Excellency Professor Marie Bashir. On a green shield, perched on a rock outcrop an eagle in its proper colours with wings displayed facing to the viewer’s left and with a gold nimbus surrounding its head beneath a gold demi-sun in splendour issuing from the centre of the top of the shield and itself charged at the honour point with a voided triangle also gold. In 2009 the College adopted the standardised depiction of the arms shown on this page, which was used in the magnificent representation above the main doors to the Hintze Building. This followed some considerable research. In 2007 Christopher Lindesay established that the arms had been “assumed” some time after the foundation of the College, that is, were adopted without having been granted by an heraldic authority such as the College of Arms in London. In 2008 a search of physical evidence at the College disclosed 48 representations of eagles, in windows, carvings and statues, and on documents, publications and letterheads produced over 150 years. There was a good deal of variation in the elements customarily placed on the shield, including the shape and orientation of the eagle, what it is standing on or clutching, the nimbus (halo), and the sun and its rays. After much discussion and deliberation, this final interpretation of the heraldic blazon shows a proud eagle standing on a rock, head held high, towards the sun which depicts God. The Trinity has been placed inside the sun, the halo modified to a solid disk and the eagle’s stance is one of power and majesty, as opposed to his predecessor, who needed a good feed. His wings are on the verge of flight. This bird is going places! While a shield is the standard support element for armorial designs in British heraldry, including for colleges and universities, a circular seal is more common for academic institutions in continental Europe and is also widely used in the United States. The logo adopted in 2015 places the same proud eagle with his (or her?) talons on a seal rather than a shield, and simplifies the design by reducing the elements and concentrating on the sun’s rays. The motto is accommodated within the seal rather than on a separate scroll. This contemporary design is used on all digital and printed materials – without prejudice to the traditional coat of arms.